Movie Review - 'The Hunger Games: Catching Fire' - A Darker Vision Of That Dystopia The Girl Who Was on Fire is back in a darker tour through Suzanne Collins' dystopia, this one directed by Francis Lawrence (I Am Legend). 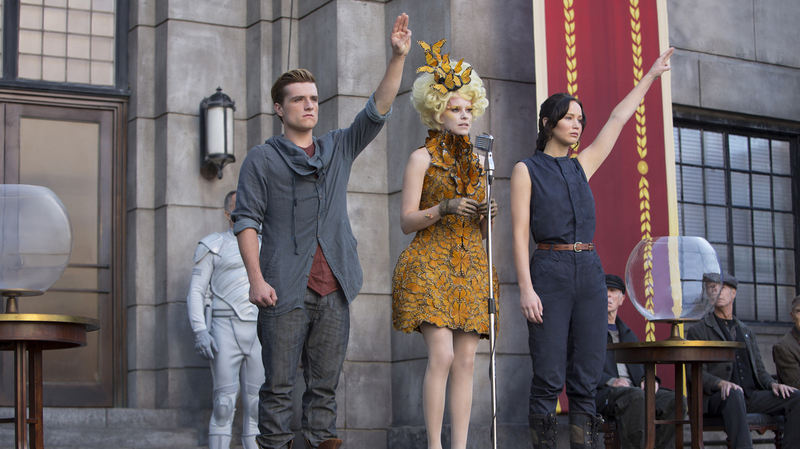 Jennifer Lawrence, Josh Hutcherson, Liam Hemsworth and Donald Sutherland star. Effie Trinket taps Katniss Everdeen (Jennifer Lawrence, right) and Peeta Mellark (Josh Hutcherson) for the Hunger Games arena again — but this time the rules are different and the stakes are higher as rebellion brews in Panem. Rated PG-13 for intense sequences of violence and action, some frightening images, thematic elements, a suggestive situation and language. There's a moment of chilling violence in Catching Fire, the second of four planned movies adapting Suzanne Collins' dystopian Hunger Games novels, a moment in which the difference a director makes becomes immediately clear — and one that should give hope to readers who might have felt some disappointment with the first movie. It's the first significant bloodshed in the film, a scene in which the young heroine Katniss Everdeen (Jennifer Lawrence) is made to fully realize the capability for cruelty inherent in the government of Panem. That's the post-apocalyptic future America in which a wealthy, technologically advanced Capitol squeezes labor and resources out of 12 subjugated districts through force and fear. Director Francis Lawrence holds the victim unflinchingly at the center of the frame, and we're spared seeing the full impact of an execution-style bullet to the head only by a closing door. Contrast that to the jittery, unparseable hand-held close-ups that director Gary Ross employed as a means of obscuring violence in last year's first installment. Ross' stylistic choice was all ostentatious distraction, distancing the viewer from the horrors onscreen until they lost their power. Lawrence's calm control over the images we see never allows us that distance. 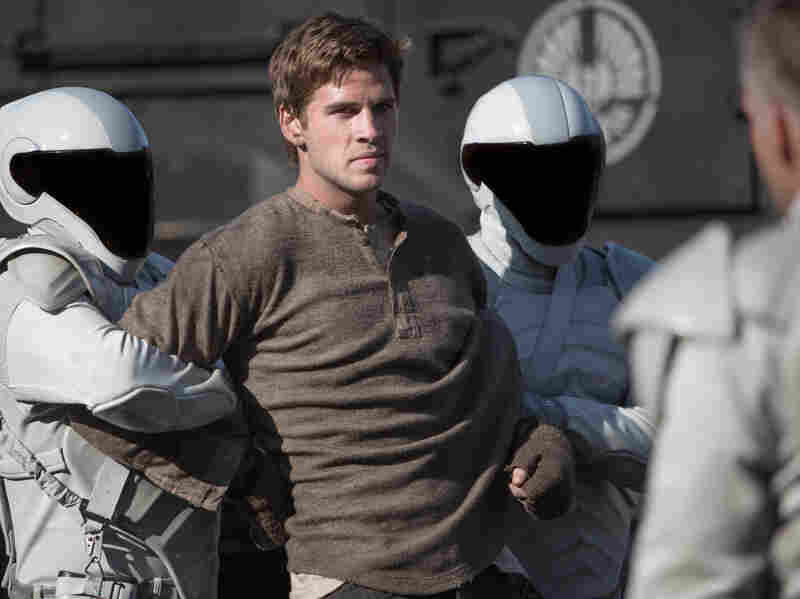 The third point of the movie's love triangle, Katniss' hunting partner Gale Hawthorne (Liam Hemsworth), remains stranded in District 12 without as much to do as the other two. The focus turns in Catching Fire, though, from the disturbing notion of kids killing kids in a gladiatorial competition to the direct violence of totalitarian governments. While the new movie does feature another iteration of Panem's annual bloodsport, most of the competitors are adults this time, with entrants culled from past victors instead of children from each district. It's a twist devised by the scheming President Snow (Donald Sutherland) and the head of the games (Philip Seymour Hoffman) to allow them to kill off both Katniss and her revolutionary image; it was her defiance of the rules, remember, that determined the outcome of her first Hunger Games. Since then, her win has managed to spark unrest and rebellion within the districts. Everything that felt clumsy in The Hunger Games has been improved upon here. That's most apparent in the clarity of the action, but it also extends to how efficiently the film establishes so many new ensemble members. The middle section, in which the fighters train and form alliances before the games, doesn't feel as haphazard as before, as the director and co-writers (Simon Beaufoy and Michael Arndt) focus on just the right moments to quickly define the cast of supporting characters — brash, ego-driven Finnick (Sam Claflin), angrily rebellious Johanna (Jena Malone), introverted tech genius Beetee (Jeffrey Wright). The character of the Capitol city itself is more efficiently defined, largely through a set design that draws direct lines to the Third Reich, with banners and Teutonic architecture looking like Technicolored outtakes from Triumph of the Will. Even the barely functional alcoholism of Katniss' mentor (Woody Harrelson) seems more like an actual part of his character than the quickly forgotten quirk it registered as in the first film. Only Katniss' romantic confusion remains unconvincing, and that's largely owing to the lack of screen time for Gale (Liam Hemsworth), the hunky object of her affections back home. Establishing why she shares such a connection with Gale — as opposed to with Peeta (Josh Hutcherson), who won the games with her last time — is difficult when they're not together much. Plus, Hemsworth's stoic swagger and square-jawed good looks make pulling for him feel a little like rooting for the personality-deficient quarterback to get the girl. Lawrence takes full advantage of Catching Fire's status as the middle chapter to make things as dark as possible. Like The Empire Strikes Back or The Dark Knight before it, the film is freed from having to provide satisfying resolutions or neatly resolved plots. Even if characters make it out of Chapter 2 alive, they're often much worse off than they were at the start. This is the Hunger Games movie that the first one failed to be, as dire and punishing as Collins' books often are. While it wouldn't be accurate to call it uncompromising — the necessity of its PG-13 makes that impossible — Lawrence works around the necessary compromises without letting them undermine the film. The series may never get better than this, but it's clearly in the right hands now.